If you work in an organization that executes much of its work as projects, your life probably feels like a slow-moving emergency — at least some of the time. When we've been through a long stretch of such chaos, we sometimes feel responsible for it. That is, we feel that we've done something wrong, or failed to anticipate something obvious, or that we lack certain skills or capabilities. Usually, the facts simply do not support these feelings. This e-book gives you a different perspective. How To Orderebook are based on observations I've made of client organizations and others over a span of 15 years. They're intended to get you thinking about how your organization deals with the problems of project management in a dynamic, fast-changing world. The book is packed with insights, new perspectives, and tools for solving the problems that managers and project managers face every day. Because every person and every organization is unique, you'll probably want to tailor the approaches suggested in Chaco Canyon for Project Managers but they'll get you thinking about a solution that will work for you. Write to me about how it turns out at the email address below. You can get this e-book by ordering it by credit card below. When we receive your order, we'll send you instructions by email for downloading it. Enjoy! A visit to Chaco Canyon leads to a gift of some important insights. 2	Conflict: Manage It or Manage Our Response to It? Conflict, especially unnecessarily hostile conflict, can reduce productivity. But conflict isn't actually good or bad, in itself — what matters is how we respond to it. Here are 12 guidelines for responding to hostile conflict. Although cubicles do provide facility cost savings over walled offices, they do so at the price of increased product development project execution delays and costs. 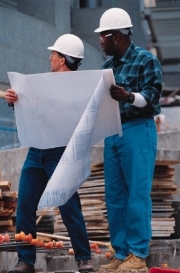 Facilities planners and managers typically aren't held accountable for project schedules, yet decisions they make can have dramatic project schedule impact. How important is this effect? Three-quarters of human resource managers now say that skilled workers in their industries are "scarce." The cost of hiring and training a replacement worker now averages 30% of annual salary, and it's even higher in critical occupations. Among sources of turnover, one that stands out is workplace stress. And nothing does more to create an atmosphere of stress than does an organizational feud. 6	When Is Change for a Dollar Only 82¢ ? In the good old days, most people worked on one and only one task. As we've learned to "work smarter," this is less and less often the case — people split their time across several tasks that need their particular expertise. Is this really smarter? What are the full costs of dividing a person's attention? From time to time, most of us have to do annoying or unpleasant tasks. And most of us, to one degree or another, procrastinate. There are numerous strategies for dealing with personal procrastination, but what do you do about procrastination as an organizational pattern? Here are eight strategies for reducing the blocks that keep your organization from getting things done by the time you would have liked to have gotten them done. 10	Why Complex Technology Projects Are Usually "Late"
Have you ever worked on a complex technology project that was completed on time? Probably not. And when a project is late, we usually feel bad about it, and the people who depend on us feel let down. The problem is that our intuition about scheduling is misleading us. It's all so avoidable — if only we understand what's really going on, we can dramatically improve our ability to project schedules. When someone asks for — or demands — something that we know is utterly impossible, we sometimes agree to provide it. Why, we later ask, did I ever agree to that? Here are some ideas for avoiding traps of this kind, and some alternatives to that simple "yes." When we use spreadsheets to provide support for enterprise-scale decisions, especially financial ones, it's essential to take care that the contents of the spreadsheets are what we hope they are. Reviews and inspections, as adapted from the way they're used in software development, provide a useful means of enhancing spreadsheet quality and reliability. Much of the software quality knowledge within software companies applies not only to their software products, but to their financial models and reporting tools. Transferring that knowledge from the Software Quality organization to the Finance organization requires translation of terminology and an understanding of cultural differences, but once these are achieved, software companies can harvest additional value from their Software Quality organizations. In the workplace, some things can't be discussed — they're taboo. When we're aware of taboos, we can choose when to obey them, and when to be more flexible. When we're unaware of them, they can limit our ability to change. When an emergency of any kind threatens or halts the operations of your organization, you activate contingency plans, if you have them. A technical emergency, such as Y2K or the Apollo XIII event, presents special problems, best dealt with by a Technical Emergency Team. Here are the basic issues you need to think about before you train, deploy, support, or manage a Technical Emergency Team. By now, most of us understand that leading a successful change effort is a difficult job. It can be a little easier, though, when we recognize that to change an organization, its people must see their roles in it differently. If we focus on the people, and how they change themselves, we do a lot better. We often think of unworkable ideas as a waste of time and effort. But unworkable ideas often lead to good ones. This happens so frequently that it's worth reconsidering how we handle ideas before we know they're unworkable, and how we handle their authors afterwards. 21	What Do You Do When You're Stuck? It sometimes happens in project work that a problem arises that has no obvious solution. And it can happen that the team might try a number of solutions and still not resolve it. If the problem persists, you can reach a state where you simply don't know what to do. What do you do then? 22	Who's Doing Your Job? That's easy — you are. Or is it really so simple? Sometimes the answer to this question isn't so clear. What if you're a project manager and you're also responsible for doing some of the work of the project? Or what if you're the project manager and the sponsor of the project? These dual roles can introduce inherent conflicts of interest that make it difficult to answer the question "Who's Doing Your Job?" Most of us get too much email. Some is spam, but even if we figured out how to eliminate spam, most of us would still agree that we get too much email. What's happening? And what can we do about it? Price: USD 11.95 per copy. 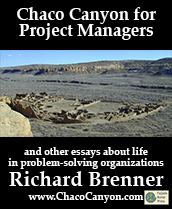 Order Chaco Canyon for Project Managers by credit card, for USD 11.95 each, using ClickBank.com.